Chinese Government is offering bilateral Cultural Exchange Masters scholarships to the meritorious students of Pakistan who wants to study abroad. 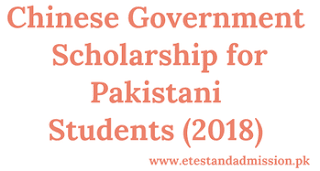 These scholarships are fully funded as the Chinese Government is providing educational cost expense, accommodation, and monthly living allowance. 1) Candidates must have completed 16 years of education (BS / BSc MA / MSc) - 1st Division in any of the subjects mentioned above. 2) Max age of the candidates should be 35 years. Note: Shortlisted Candidates (If applicable) will have to take the Language course. Candidates would be selected on the basis of their score in GRE NTS Test, observing the Provincial Quota. Following were the seats allocation in 2017. However, it can vary this year. Candidates fulfilling the eligibility criteria can apply from the link mentioned below. Create a new account on the link. Fill the details carefully and then print the form with fee challan. After depositing the fee in the bank, courier the form with deposit slip on the address mentioned on the form. Note: After Shortlisting candidates will have to apply separately.